(CNN) - An emergency missile alert accidentally went out to everyone in Hawaii on Saturday after an employee "pushed the wrong button." How did it happen? Hawaii's Emergency Management Agency provided a bit more detail Sunday on what went wrong. The mishap took place during a routine drill run after a shift change, Vern Miyagi, the agency's administrator, said. During the drill, an officer in the emergency operation center mistakenly selected an incorrect "template," which shows what message is going to be sent, Miyagi said. The template that the officer inadvertently selected was prepared to send the message to the public. The officer was supposed to have chosen a template that would only be sent internally. After the template is selected, Miyagi said, a note appears on the computer, asking the officer to confirm that they want to send the message. The officer responsible accidentally clicked yes, Miyagi said. At that point, the message -- "BALLISTIC MISSILE THREAT INBOUND TO HAWAII. SEEK IMMEDIATE SHELTER. THIS IS NOT A DRILL" -- was sent to Hawaii residents and vacationers. It also went out to televisions and radios. At the time, there was no template that allowed the EMA to promptly send a follow-up message informing recipients that the alert had been a false alarm. That's now been changed, Miyagi said. A false alarm template has been created, and a manager on duty will also have to give an affirmative confirmation before the message is sent, both during tests and in the event of a real threat. The officer responsible for the mistake has been disciplined and reassigned, Miyagi told CNN, but not fired. On Saturday, it took the agency 38 minutes to send a second alert confirming the message was a false alarm. 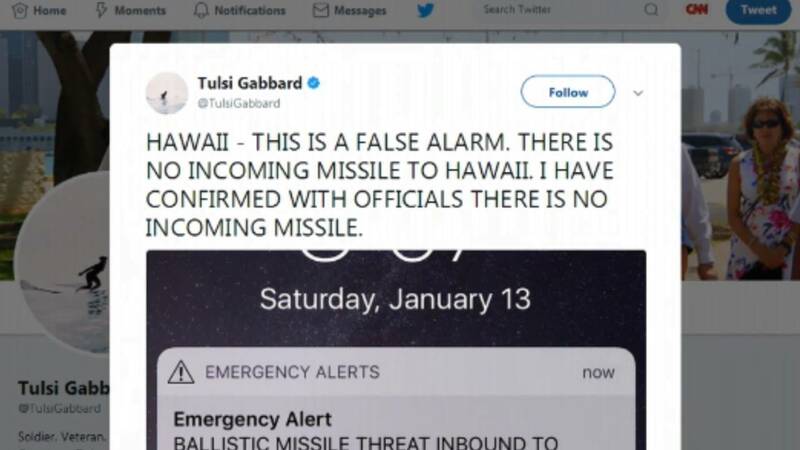 In the interim, US Rep. Tulsi Gabbard and the EMA sent out tweets telling Hawaiians there was no imminent missile threat to the state. The initial alert sent terrified people scrambling for shelter, believing they were about to die. Officials' initial explanation was an employee had "pushed the wrong button." "I know firsthand that what happened today was totally unacceptable," Gov. David Ige said Saturday, "and many in our community was deeply affected by this. And I'm sorry for that pain and confusion that anyone might have experienced." In December, the state started monthly testing of its nuclear warning siren system, which is aimed at alerting residents to an impending nuclear missile strike. The state Emergency Management Agency said Monday those tests will be suspended while it investigates. Hawaii began the tests in response to escalating tensions between the US and North Korea, which could hit the islands with a missile within 20 minutes of a launch.